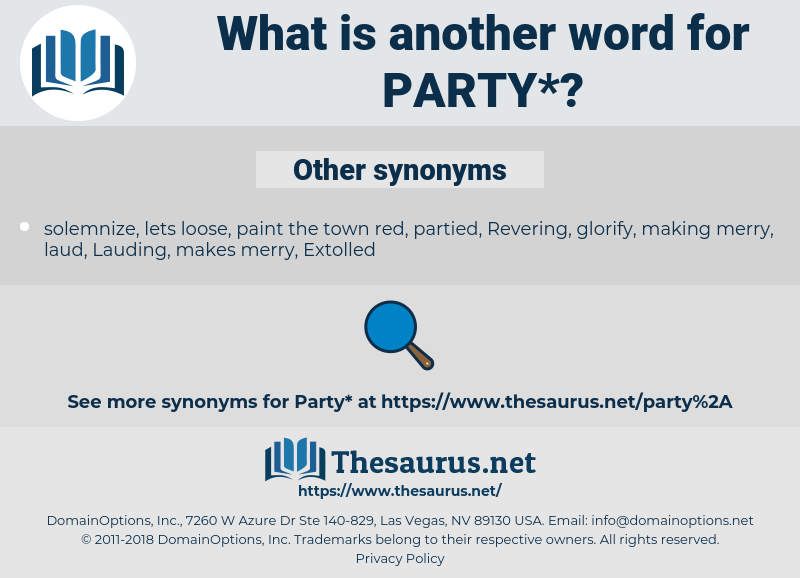 What is another word for party? part, requirements, Rights, Aspirations, aspects, councillors, Replies, obligations, councils, responses, partido, Bodies, comments, figures, Has, Its, Does, parti, group, groups, parts, meetings. Festivities, proportions, passages, segments, Holidays, gangs, benefits, amounts, ranks, corners, swaths, Leaves, bits, games, guys, fences, parts. 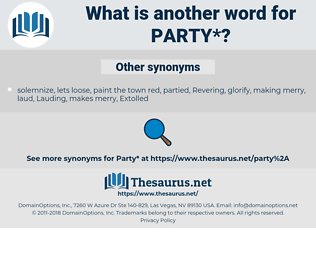 Capita, part, party-political, group, majority, birthday, fraction. Participated, Disappeared, ratified, represented, celebrated, Appeared, departed, started, Passed, proposed, Encompassed, Acceded, contained, turned, expressed, said, Arrived, sat, Proceeded, Took, Contributed, Belonged, conducted, engaged, enrolled, broke, competing, added, fell, found, dashed, Walked, plugged, Served, part, groups, partied. Indicating, Explaining, Staying, approaching, speaking, entering, suffering, sitting, competing, coming, belonging, being, engaging, coping, dealing, Stemming, becoming, Quitting, heading, joining, missing, leaving, going, serving, living, part, parts. Participated, Perpetrated, categorized, Disappeared, Attributed, ratified, represented, implicated, Predicated, Originated, Existed, started, featured, Stationed, Adhered, Enunciated, entrenched, affiliated, considered, retained, classified, Comprised, assigned, Excluded, reflected, Acceded, Captured, discarded, contained, absorbed, situated, sustained, Enshrined, admitted, Regarded, experienced, Premised, located, Embarked, Earmarked, associated, resigned, Anchored, Entered, rooted, subsumed, Contributed, attached, drawn, listed, Exercised, Consigned, Cited, derived, Housed, embodied, engaged, Flown, employed, Judged, biased, tied, formed, covered, added, built, guided, discharged, founded, Counted, driven, linked, bound, embedded, Served, based, placed, named. participates, departs, splits, starts, originates, includes, SITS, proceeds, enters, assumes, contributes, belongs, relies, Forms, stems, adds, Halves, falls, begins, serves, goes, Bases, builds, Leaves, part, parts. critter, observer, onlooker, looker-on, beast, single, BEASTIE, wallflower, spectator, watcher, bystander, brute, nonparticipant.
" Let's have a Toy Party. form of government, political system. fete, jolly, tea party, brawl, fiesta, ceilidh, house party, dance, feast, cocktail party, bash, whist drive, bun-fight, DO, bunfight, birthday party. liberty party, shindig, dinner, greenback party, know-nothing party, constitutional union party, sociable, lawn party, democratic-republican party, farmer-labor party, stag party, conservative party, progressive party, American Federalist Party, party to the transaction, Labour Party, liberal party, labor party, anti-masonic party, masque, green party, fatigue party, black panthers, Nazi Party, masquerade party, dance, reception, opposition, smoker, bull moose party, war party, shindy, socialist party, federal party, stretcher party, gop, rescue party, socialist labor party, shower, militant tendency, social democratic party, slumber party, Fete Champetre, American Labor Party, Whig Party, party to the action, dixiecrats, liberal democrat party, people's party, open house, soiree, guomindang, wedding, search party, American Party, dinner party, wedding party, masquerade, mixer, landing party, communist party, reunion, populist party, hen party, states' rights democratic party, third party, prohibition party, republican party, mask, garden party, gironde, democratic party, free soil party, National Socialist German Workers' Party, kuomintang, federalist party, housewarming, social. intervenor, litigant, litigator, Jane Doe, assignee, reversioner, vouchee, tort-feasor, Richard Roe, tortfeasor, contractor, assignor, John doe. function, occasion, social function, social occasion, affair. lot, organization, social gathering, circle, set, social affair, band, organisation. somebody, soul, someone, person, mortal, individual.